What’s there to say about Bandon Dunes that hasn’t already been said? David Mclay Kidd’s masterpiece is what started the Bandon craze and without it, the world class golf destination would be nothing like it is today. For starters it’s the only golf resort in the world to boast 4 courses on Golf Digest’s 100 Greatest. Oh, and all of those things you usually see at high end resorts? Expensive homes and hotels? Insane greens fees? Over priced restaurants? I don’t think a tagline has ever been so dead on before. In the last 6 months I’ve taken two trips down to Bandon, and played all of the courses down there. The experience both times was nothing short of incredible. One thing that sets Bandon apart is it’s affordability. Now, don’t get me wrong, the courses are by no means cheap, but at under $300 in peak season, with half price replay rounds, there are very few places that can compare. Let’s put this in perspective. You can get a round at Pacific Dunes and Bandon Dunes (both top 10 public courses) in the middle of summer, for less than the price of one round at Pebble Beach (and there you have to be a guest to even play). In the off season this gets even lower. This past February I got a room for two nights and 4 rounds of golf, and paid just over $500. That’s insane! I could go on and on about the resort, the courses, and everything else – but so much has already been said by every other major (and minor) golf publication there is, as well as this one (see above recaps), that I thought I would do something a little bit different and tell you about my favorites on the course and at the resort. Everyone’s favorite question when you’re at Bandon is “what’s your favorite course?”. And every single person has a different answer. I don’t know of any other place that has such broad opinions – a testament to the quality and uniqueness of each course. Bandon Trails – The lowest rated, and most overlooked. I think this has the best layout, most varied topography, and is unlike any other course I’ve ever played. Pacific Dunes – I haven’t played well either of the times I’ve played Pacific (and one was in driving rain). But there’s no denying the combination of ocean views, unique holes, and sheer fun of the round. Bandon Dunes – Bandon feels like a little bit more of a modern course compared to Old Mac and Pacific – but still has a very links feel. I’ve shot well both times on this course, and liked it even better the second time around. Who knows maybe round #3 will move this up a notch? Old Macdonald – The only Bandon course that I’ve only played once. It was at the end of a long day, and my stamina was wearing. It does have some of the most unique holes on the property, and is without a doubt a fun round. The par 3 course Bandon Preserve is also TOTALLY worth playing. We had close to 40 mph wind and rain, but it just made it that much more interesting. #12 was the very first hole built on the property, and the one Iv’e heard many people say is their favorite par 3. I personally like #15. The giant bunker on the right side makes for a very intimidating feature, and depending on wind you can play anything from a mid iron to a 3 wood. Close behind is #6, but after the views on the powerhouse combo of 4 and 5, it’s a little bit less dramatic. Man, how do you choose just one. My knee jerk reaction would be to say #4 – simply because it’s one of the best approach shots on the entire property. To hit a seemingly normal drive, and walk up to the middle of the fairway and see the green hovering above the ocean is absolutely spectacular, regardless of whether it’s the first or tenth time you’ve seen it. One of the most beautiful approach shots in golf, on the 4th. 5 is a classic and the combo of 4, 5, and 6 easily rival any other three hole stretch on the property. However, I think 16 may take the cake as my favorite hole. It’s easily the most dramatic hole on Bandon Dunes, but it also has an element of risk/reward and misdirection that make it extremely interesting. From the tee on 16. First you have to hit it over a canyon, and then up to the top of a ridge to have the best approach. If you go for it, and don’t clear the ridge you could end up in an awkward purgatory region that will make you wish you just laid up to begin with. As far as hole design goes, I also like number 8 with the army of bunkers you have to clear off the tee. The par 5s are actually the one thing I think Bandon Dunes is a little bit lacking on. I mean none of them are bad but they also don’t really do much to wow me. My favorite is probably #3 as the gorse in play on the right, and there’s some strategic bunkering you need to be aware of. 13 is also unique in that it doesn’t have any sand, and features the only water hazard on the course. But aside from the bumpy, undulating fairways, I found it to be a little bit boring. That said, it was pretty fun to reach it in 2 and miss my eagle putt by a foot. I feel like all of Bandon is just one big unique feature. Whether it’s the pricing, design, accommodations – it really is unlike anything else out there. But to be honest, I think the most unique feature of Bandon Dunes is how it came to be. Mike Keiser the Chicago businesses-man who had the vision for the resort created Bandon with an architect who was relatively unproven in David McLay Kidd, at a destination about as far away from anything as it gets, and did it all for a fraction of the price of most new resorts. It’s exactly the kind of thing you want to see more people doing. 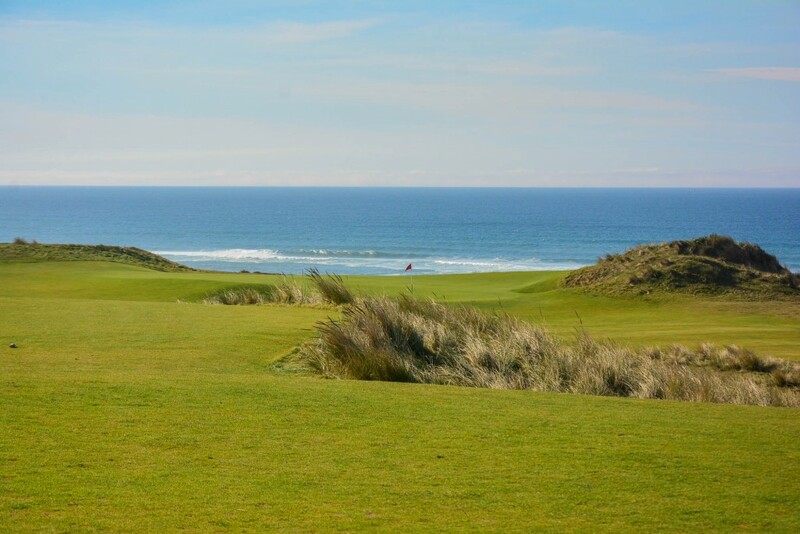 For more on this check out Dream Golf – a must read before any Bandon trip. The most memorable shot may be the the one that doesn’t even make the fairway. An unofficial right of passage at Bandon is to hit a ball into the ocean when standing on the 17th tee. It’s the closest point to the water on the course, and there’s something about teeing up there that gives you chills knowing thats what they did during the earliest days at Bandon. So next time you’re there, don’t forget to tee up and pay your homage to the golf gods as a thank you for creating such a spectacular and memorable golf experience. I think Bandon Dunes as a course is probably right on at 38 in the Greatest 100 and 6 in the Top 100 Greatest Public. It has a unique variety of holes, incredible scenery, and it gets bonus point in the “overall experience” category. To be honest I think that Pacific Dunes is probably slightly overrated. My rounds there were great, but is it top 3 public in the country? I’m just not totally convinced. As much as I wanted to like it the better, I do think Whistling Straits was a better course. How Did You Like This Format? Better? Worse? Let us know! Want Some More Photos? You Got It! Great article, with some really good photos (not always easy!). But you made a statement that is seemingly false. You said you had played all the courses in Bandon, but only listed those at the resort. There is another just 10 miles south, called Bandon Crossings. Next time you play Bandon ask the caddies where they play; it might be Crossings, since a lot of them do. Even though they can play the resort for free, they pay to play Crossings. Perhaps they want a break from the wind, or all the walking by riding a cart, or want to enjoy some great conditioning. It’s a challenging par 72 with some real interest. PGA Travel Magazine called it a hidden gem. You seem to be somewhat price sensitive, since you played in November and February, but you mentioned $300 as a value point (and for the very high end courses it is). Most of us have to at least consider price, which is why Golf Magazine did a piece listing affordable alternatives, with Bandon Crossings being suggested for Bandon Trails. They do share a common feature of moving away from the sometimes grueling winds at the edge of the coast and winding through more protected woodland meadows. (Bandon Trails by design moved into the woods to give a break from the wind, and you appreciated the great design they still managed to achieve). 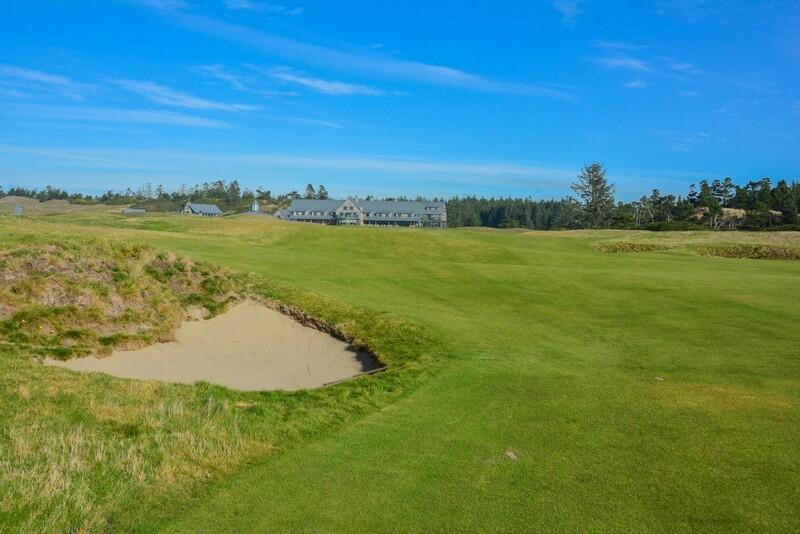 Bandon Crossings may never be famous, but it will still be a great track, and a great value. Next time give it a try. Thanks for the comment Carla! I’m assuming based on the tone of this comment that you either own or work at Crossings, and if so, congratulations as I’ve heard nothing but fantastic things about your course. Playing Golf Digest’s Top 100 isn’t exactly a cheap endeavor, which is why I always go down to Bandon in the off season. As you know the weather can still be beautiful there in the winter! The trips are usually quick, but I promise to get out and play Crossings one of these days – would love to check it out. I love the photos and based on your recommendation will play Preserve this April when I make my 8th pilgrimage to the Golf Mecca. Great review! Isn’t Pebble Beach public? Yep it is, did I say in there it wasn’t? Just got back from a 6-night, 7-round stay at the Bandon resort– fabulous!! As a senior, I felt very comfortable playing 1) just 18 each day, and 2) the gold tees– a perfect challenge for my game (although I did try to take in the view from the back tees on as many holes as possible). Although not my favorite of the four courses, it may have the best finish in holes 15 thru 18– especially the incredible par-4 16th, which well deserves all of the accolades it has gotten. And one shouldn’t overlook the great stretch of 4 thru 7 on the front side. Rating: 5 stars out of 5!